People living in Pakistan-occupied Kashmir primarily see themselves as being of Kashmiri origin and not Pakistanis, a 'Citizen Public Opinion' survey conducted of the region has revealed. Responding to a question on which of the following identities they would attach themselves with, 73 percent said Kashmiri, while 27 percent said they would prefer to be referred to as Pakistani. A majority of the people participating in the survey in PoK said they would be in favor of getting support from China to resolve their national identity. In reply to another question as to which one of the following countries' support they would seek to resolve their 'national question', most opted for China, while 21 and 18 percent of the participants opted for Saudi Arabia and the United States respectively. The survey was collected from a rich, random, representative and diverse range of public opinion of about 10,000 people spread across 32 sub-divisions of Pakistan-occupied Kashmir. Representatives of the local administration, judiciary, Members of the Assembly, lawyers, academics and the general public took part in the research and supported it in public interest. Comparisons were also made with other surveys in terms of analysis, observations and qualification. The field work took five years and two months, including a dedicated two years in aggregate. It took almost nine months to sift through the accumulated data and come out with a meaningful analysis. In all, three questions were asked on the enduring 'national question' of Jammu and Kashmir; two on governance; three on the state of the economy and two on social policies. Each interviewee was offered choices and options and not limited to those choices. For instance, when the participants were asked whether they believed in the integrity of the state of Jammu and Kashmir as it existed in October 1947, three months after the partition of the Indian subcontinent (84,471 square miles), 97 percent (9,700 persons) of them replied in the affirmative, while two percent (214 persons) said no and one percent (75 persons) said they did not know. Thirty-nine percent of the respondents (3,887 persons) said that they would look to China for support on the issue of "national question" of Jammu and Kashmir. The other countries that found favor were Britain, Saudi Arabia, Turkey, the United Arab Emirates. The United States featured third in the list of countries that would be considered for support on the issue. Looking to Pakistan or Pakistan and India or India, Pakistan andChina together was not considered as viable options. 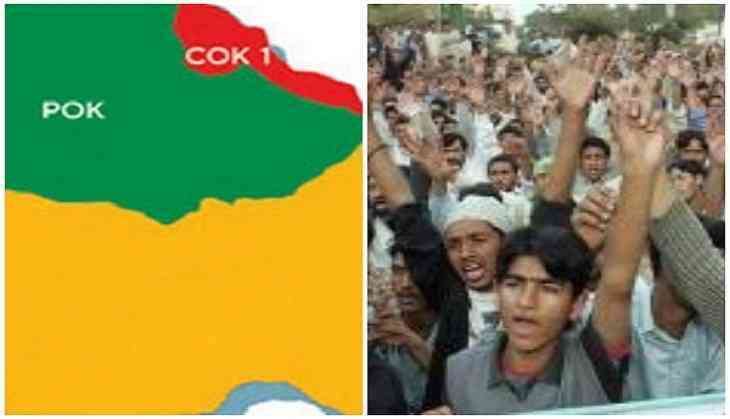 Seventy-one percent of the respondents (7,122 persons) said Muslims can co-exist with non-Muslims in Kashmir, while twenty-eight percent (2,775 persons) said such a possibility was unfeasible. Forty-seven and thirty three percent of the respondents rated the current state of administration in Pakistan-occupied Kashmir as "Bad" and "Weak" respectively. Ninety-eight percent of the respondents to the survey (9,781 persons) said it was important to have a contract on services and responsibilities between the citizen and the state. Twenty percent of the respondents (1,987 persons) said that for the region to have a viable economic policy, it was essential to first ensure opening of trade routes throughout the divided state and beyond; secondly to have one's own currency (public treasury/fiscal policy) and thirdly to have and conduct research and ownership of resources. Seventeen percent said ensure opening of trade routes throughout the divided state and beyond; have and conduct research and ownership of resources and have one's own currency (public treasury/fiscal policy). Forty-seven percent of the respondents favored a 50:50 public and private ratio of participation and partnership in the economy; while 15percent opted for a 60:40 ratio. Thirty-eight percent favored a 70:30 ration of participation and partnership. Sixty-eight percent (6,782 persons) of the respondents said that natural resources should be opened for privatization, while thirty percent (3,021 persons) replied in the negative. Ninety-nine percent of the respondents (9,858 persons) said that there should be equal rights and responsibilities amongst citizens irrespective of caste, creed, color, ideology or religion. The 'Citizen Public Opinion' Survey was crowd funded by citizens of Pakistan-occupied Kashmir and involved a proposition to each interviewee to voluntarily contribute to the expenses involved in conducting it. Over 85 percent of the interviewees were asked these ten questions face-to-face and in a local language (Pahari or Urdu), without actually showing them the form unless they specifically requested to see it. The form remained in English and was never translated into any other language. About 1,995 of the 10,000 respondents or 20 percent were students and questions and answers were fielded and sought in the local language. Six of the interviewees submitted their opinion online, while two returned the form after a few days. Ninety percent of the respondents (8959 persons) were males and1041 (10 percent) were females. This was because PoK as a society continues to remain relatively conservative in comparison to Western Europe. Women by and large are not visible in public life and randomly sampling them could have created perception problems for the researchers in spite of best intentions. The women who took part were interviewed at courts, hospitals, social welfare organizations, banks and educational institutions. Fifty-four percent of the respondents were in the 16-30 years age group; 24 percent in the 31-45 years age group; 16 percent in the46-60 years age group and six percent in the 61-plus age group. Twenty-fivepercent (2465) and twelve percent (1236) of the respondents belonged to thebusiness/retail environment or the government servant category respectively. In all, 27 broad categories of people were interviewed which covered perhaps every occupation that exists in Pakistan-occupied Kashmir. It was concluded that the status, identity, governance, economy and society of Pakistan-occupied Kashmir continues to remain in legal limbo even after the withdrawal of the British colonials in 1947. It was also concluded that the legislature, judiciary and executive is presently ill-equipped to take appropriate steps to work in conjunction with local citizens to improve matters from where they are at now.